February 16, 2011 - Malta International Airport welcomes the announcement on Tuesday that it is one of the top performing airports in the annual ACI Airport Service Quality (ASQ) passenger survey, by placing first airport in Europe across all categories. Commenting about this achievement, Malta Airport Chief Executive Officer Julian Jaeger said that once again, the airport?s continuous investment in enhancing service levels has reaped the desired results, and has not only been recognized by the industry through the Airport of the Year Award last year, but now also through the direct input from passengers. Jaeger also commented on the other important placing achieved by Malta Airport in this survey, which is that of fourth best airport in the world in the 2 ? 5 million passengers category. ?This prestigious placing in the world?s leading Airport Passenger Survey is a sign that we?re on the right track to ensure that the passenger experience at Malta International Airport is a positive one and is recognized by the passengers themselves.? He said that whilst one has to admit that in surveys such as the ASQ, small airports are at an advantage, one cannot diminish the great feat achieved by Malta Airport in placing first across all airport categories in Europe. He added that one has to see this achievement in the context of the fact that the high service levels were maintained while managing a 12.9% increase in passenger movements during 2010, resulting in a record year of 3.29 million passengers. ?Over the past years, Malta International Airport has garnered a number of prestigious awards including the ACI Best Airport in Europe in the 1-5 million passengers category, as well as various top placing in previous editions of the ASQ Passenger Survey.? He concluded by stating that these achievements were due to the commitment of all MIA employees as well as to the hard work of all other stakeholders present at the airport. ?Our commitment to the tourism industry in the Maltese Islands as well as the ongoing process of diversification in our operations is a sign that Malta International Airport has adopted a pro-active attitude to the ever-changing nature of the aviation industry.? Malta International Airport is the only airport in Malta and it serves the whole Maltese Archipelago. It is located between Luqa and Gudja. It occupies the location of the former RAF Luqa and was completely re-furbished, becoming fully operational on March 25, 1992. It is still referred to by locals as Luqa Airport, and sometimes as Valletta Airport internationally, as it is located 5 km (3.1 mi) southwest of the Maltese capital Valletta. The airport serves as the main hub for Air Malta, though many other airlines also fly to the airport, including many holiday airlines. 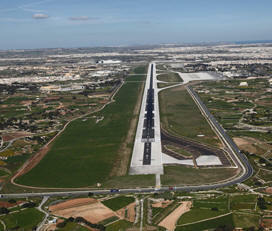 The airport is operated by Malta International Airport plc, a public limited company. It also hosts the Area Control Centre. The airport hosts the annual Malta Airshow, visited by military and civil aircraft from various European and other countries. Malta International Airport has been awarded the title of Most Noteworthy Airport for a New Small Budget Program by Passenger Terminal World, the international review of airport design, technology, security, operations and management. The airport is classified among the top 15 airports worldwide joined those of Dubai, Brussels, San Francisco, Stockholm, Heathrow, Changi, Barcelona and Vienna.